The Romfea.gr Greek portal, referring to its own reliable sources, writes that the Holy Kinot of Holy Mount Athos has received an extensive message from His Holiness the Ecumenical Patriarch Bartholomew of Constantinople recently, reports AgionOros.ru. This document expresses his concern in connection with the attempts to over-build Mt. Athos and "change its look" through the uncontrolled and free influx of monks of non-Greek origin. The Patriarchate of Constantinople informs that it will no longer grant permission to "non-Greek speaking monks" to reside in Greek-speaking monasteries. The letter also contains a recommendation, according to which the total number of foreign monks must not exceed 10% of the total number of the brethren on Holy Mount Athos. In fact, this decision means a ban on foreigners coming to live on Athos, as the number of monks of non-Greek origin at the moment exceeds 10% of the total number of monks. Athonite monks stress that this message is raising many questions, particularly in a period "when the Phanar has announcing a struggle against philetism in the Church". "This statement (if the information regarding the message of the Patriarchate of Constantinople is confirmed) casts doubt on the universal nature of Holy Mount Athos, where for over 1000 years, Greeks, Serbs, Russians, Romanians, Bulgarians, and monks from all over the world have coexisted together harmoniously. The Greek Prime Minister Antonis Samaras, during his recent visit, was astonished when he saw a Chinese monk in one of the Athonite monasteries." Sources of Romfea.gr inform that the Holy Kinot of Holy Mount Athos intends to consider the Patriarch’s message after the first week of the Lenten fast. The photo exhibition, “Spiritual links between Russia and Greece: Valaam and Mt. Athos” will take place at the Moscow House of Photography from November 10 to December 1. Is Mount Athos Avaton Being Repealed? Is Mount Athos Avaton Being Repealed? Cases of illegal fishing recorded by the “Archipelagos” institute, were registered chiefly near the south coast of Holy Mount Athos, where mainly small and materially poor monasteries are situated. The researchers’ report indicates that, “poachers are intimidating monks, threatening to burn down the forests around monasteries if the monks complain about the violators to the coast guard”. So, the argument that Greeks should allow an influx of migrants to a sacred site does not hold water. Can Greek migrants simply walk into any sacred site of any other national heritage? I am female and can't visit, but I can study and worship Christ anywhere else. There are places that were also deemed too holy for Alexander the Great to enter too. It is about respecting a sacred ancient site and it's regulations. It's up to the council to decide how they will run it. As far as social justice is concerned, Greece has been asking for the Parthenon marbles back too. I think that there is a loss of translation. The argument is perhaps about the preservation of the heritage of mount Athos. They are not opposed to people of different heritage becoming Orthodox monks. It's not a question of Orthodoxy being purely for the Greeks. Mount Athos is not a town urging for population growth and cannot be compared to a cosmopolitan gathering of all nationalities, like perhaps NY. Here the issue is of preserving an ancient heritage site, which is living and not merely stones and mortar. I see it as one may have seen Delphi in ancient times - a sacred Greek site. Indigenous Australians would never allow a migrant Greek to walk on Uluru either. When I first stayed on Athos ten years ago I was disgraced by the 10% cap for foreighners for each monasteries and it was the mainly the monasteries who decended from the Elder Joseph the cave dwellers diciples who would welcome foreigners , a lot of monks and monasteries share the Patriarchs views, even when foreigners were given greek citizenship they still had to be classed as that 10% foreign. It seemed that immigration to Athos was lower than the world . What ever happened to the greats of greek philosophy that saw nationality not coming from blood lines but from the psyche . Wasn't this Alexander the greats Ideal. The greeks can claim and quote their ancient ancestors but they can't live up to them. In one of the monasteties on Athos is an american monk , he struggled with the Greek language and was pushed out of the monastery by monks who were of the same mind as the Patriarch . The monk then and went and was living in caves it got back to the elder of the monastery that he hadn't left Athos and so the Spiritual elder thought well god has brought him here so he brang him back to the monastery made him a monk. As one monk once said to me about the Patriarch he is suppose to be our Bishop but he never comes here. As someone who has lived on Athos and have seen the struggles that a lot of non greek speaking monks have to go through .I find this an absolute disgrace , it falls below worldly standards and considering the vast amount of money western europe have given for the restoration of these monasteries because Greece could not afford to do so , shows ingratitude and a level below the world. Should the worldly nations who take in immigration follow his lead and say it changes there country . REMEMBER MANY GREEKS WERE GIVEN OPPORTUNITIES TO START NEW LIVES IN WESTERN COUNTRIES WITHOUT LEARNING THE LANGUAGE . SO WHY SHOULDN'T PEOPLE FROM SPIRITUALLY POOR COUNTRIES BE GIVEN THE SAME OPPORTUNTIES. May I add to my previous comment about the true wisdom of limiting the number of non-Greek monks on Mount Athos, by saying that it is not a matter of fairness but a matter of service in the name of Our Lord Jesus Christ. Great success has come in creating new Athonite monastic communities in America, France and England known as Athos outside Athos the purpose of which is to pray for the world and to gather Christians increasingly in need of solace and salvation. 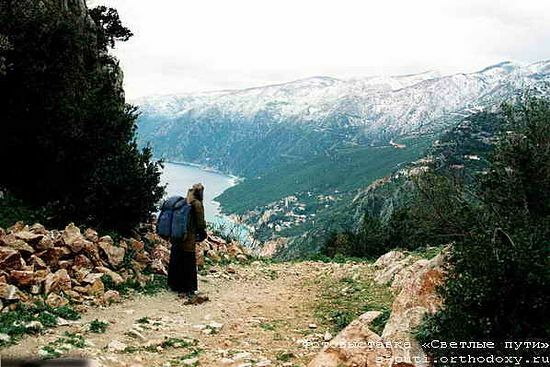 It is wise to limit the number of non-Greek monks on Mount Athos. The monastic community of The Holy Mountain is a living and delicately balanced organism which has developed over generations of cultural and spiritual wisdom interwoven with the roots of the early Greek identity. Diluting its unique ingredients will weaken it. Monastic communities much needed in all parts of our troubled planet. This recommendation limiting the monks on Mount Athos to 10% is unjust to the monks themselves and to those non-Greeks who desire to struggle there. While there are more monks there than in the past, still the decision by the Ecumenical Patriarch is unjust and reinforces the prejudice that, in Constantinople's eyes, Orthodoxy is Greek and that is all. This is simply not true! Orthodoxy is for ALL!! The Ecumenical Patriarchate has much bigger problems than to create more problems for Mount Athos. If Constantinople is not careful, Turkey will become an Islamist nation again and there might not be any more Ecumenical Patriarchate! IS the Holy Orthodox Church no longer Universal? In Christ we are all the same; there is no Jew or Greek but all are sons of God is Christ,through Baptism. What does it matter where people are from? All are created in the image of God. IF this is article is true, then I am confounded. How can such a rule be considered just? Very, very two-faced. Hypocritical in the face of rising Islam. Looks like the Greeks have not learned anything from Christ it's still all about Greek nationalism to them when Russian approach is for everyone regardless of nationality ethnicity or what language they speak everyone is equal before God and is welcomed in the church.